Pretty Pink Posh March Release Blog Hop! Hello and Welcome to Pretty Pink Posh March release blog hop! I am very excited to share with you couple of cards using the newly released stamp sets and dies from Pretty Pink Posh. I know the Birdie Notes stamp set is one of the favourite set from last release inspite of it being a free set with your order over $60. Now not only is this stamp set available for purchase, there is also another new full size birdie stamp set called Birdie Friends. Love that Birdie Friends has coordinating die set too. I had a great time colouring these cute birdies from the stamp set. They just make me feel so happy. Here is my first card. I made a shaker card using Bridie Friends stamp set and also the Pretty Pink Posh exclusive Scallop Circle die set. I started with smooshing Abandoned Coral distress ink on watercolour panel and letting it air dry. I love the effect of air dried watercolour because the colour soak into the fibre, travels and dries slowly giving beautiful light and dark shades as well as hard and soft edges. I also spattered some gold colorshine on the panel later after the watercolour dries. In the mean time, I die cut the smaller scallop circle using gold glitter paper, adhered acetate sheet on the back of the circle die cut. Then stamped the three birdies as well as the banner and watercoloured them. I used the coordinating dies to die cut them out. I stamped the sentiment inside the banner. To make the shaker element, I adhered the birdies and banner on to the top centre of the watercoloured panel, added iridescent mini heart confetti to the centre and adhered the gold glitter scallop circle die cut which I prepared earlier using foam adhesives over the birdies and banner. There is no white backing panel on the shaker element. This shows the beautiful colour wash done on the background through the shaker box. I used Metallic Gold 6mm and 4mm sequins to embellish. For my second card, I did a lot of watercolour smooshing technique. On a watercolour paper, I smooshed Salty Ocean and Mermaid Lagoon distress ink on top of the panel and Twisted Citron and Mowed Lawn towards the bottom. I did one colour at a time, making sure I dried the colour before proceeding to the next colour. This will give layers of colour and more depth than the solid look. I then used the smaller Window Frame from the Window Frames dies to die cut at the centre of the panel. I love the stitching detail on the outside. The idea was to have the sky, landscape and sun at the centre. So when I inlaid the die cut back in place, I used another piece which I smooshed with Mustard Seed and Fosslized Amber distress ink. This not only gave me sun effect I was looking for but also a focal point on which I added the birdies and other accessories. Hop(e) you like my cards using the new stamp set and dies released by Pretty Pink Posh this month. I adore the Birdie Friends stamp set for the birds. Look how cute they are! Now your next hop is to Julia Altermann‘s blog. No blog hop is without any prizes! Paulina is very generous and she is giving away TWO $25 gift certificates! Hooray! Winners will be picked randomly along the blog hop. Comments must be left by 11:59PM PST on 3/14/16. Winner will be announced on Pretty Pink Posh Blog. These are beautiful. The glittery scalloped circle against the pretty watercolor background, and that gorgeous background and inlaid scene on the second card are awesome. Love the background on the 1st card and love the colors on the 2nd! Love the chicks with the Missing You banner! So adorable! These are great cards! The little birds holding the signs are cute! Love PPP's new release. I want it all!! Both cards are very darling!!! At first glance, I thought you used glitter paper! Awesome job. Your card is so adorable! Wow Gayatri! I love your creativity! Both of your creations are adorable with glitter element in your style! Two pretty cards. Love the background in the first so much! Love your watercolor smooshing – loving smooshing and I'm so glad to see it in action! Cute cards! Wow! Both so very beautiful! LOVE the color with the gold on your first card! Beautifully done!! Fabulous color. Perfect for Spring cards. LOVE your sweet scenes and the way you've framed them. Love your adorable cards Gayatri. Thanks! Oh my gosh! The first card is my absolute fave on this blog hop! Not only is it a shaker card but the background is sooo awesome! I love all this terrific color in your cards, Gayatri! Really adorable and fun designs! Your colors are fantastic, especially the pink card! Love the black sequins too! Love the bright colors and the pop of bling cardstock! The black sequins add just the right touch! Such lovely cards! Love both of them, the colours are so amazing! cute, creative, wonderful coloring – love both cards! Beautiful! Love the gold and coral colors in the first–truly one of my all time favorite combos! Great card projects – luv all the colors and sparkle with the new PPP release. Always beautiful. I love what you have created with the new PPP products! Those Birdie Friends!!! WOW !! Great cards and so bright and fun. I love the colors, they let us know spring is right around the corner. Love your work. Such cheerful colors!! 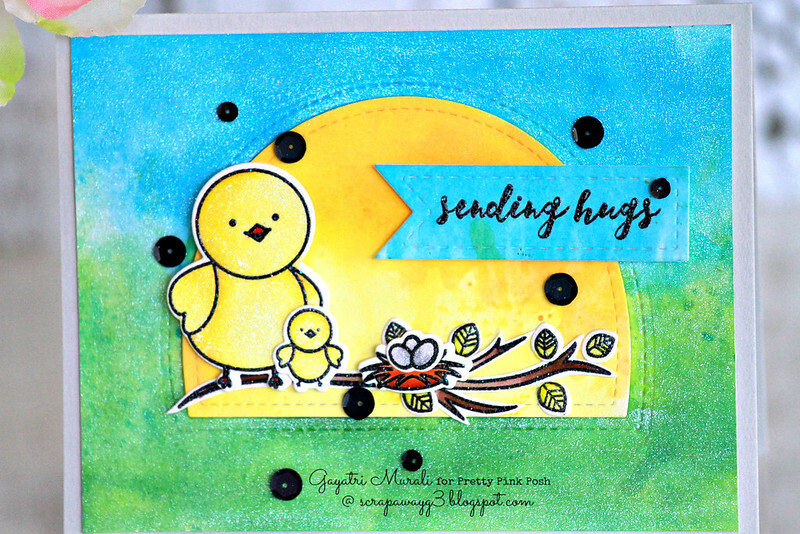 Love all the distress ink and those super cute birds!! Beautiful cards Gayatri! The birdies are so cute!! Adorable cards! Love that awesome scallop circle die all glittered up! Such cute birds! Awesome cards Gayatri. Good work. Mmm – that creamsicle orange is so happy! Love them both! Beautiful projects, love the gold scalloped die. Nice cards with great details! Love the colors on both cards. Thanks for sharing. I had to smile when I saw the “missing you” card. Love the circle on the first card. Great job. I especially like that first card, very unexpected color and i just love it. TFS! Your cards are just too much fun, Gayatri! I love the gold scalloped circle frame and the smooshing on the first card. And, the second one is equally appealing. Thanks for the inspiration. Really cute cards! That first one really looks like a party is going on. Those birds make everything look so adorable! Pretty and colorful! I love the shimmer! Love how you did the cards. Love the cards – the colours are great! Super cute little birds = and I love that arch die. Super cute cards! I love the background on the first card. I love your beautiful background on your first card and all your great colors on the second one. Those little birds are the cutest. These are great cards! I love the glitter paper with the sequins in your first card..they really balance each other well. The second card I love the bold spring colors..very eye catching! TFS! Great cards! Love the shaker and the chicks in the back of it. perfect color choose for both cards! Beautiful cards made! Love it! Colors are just lovely! Thanks for sharing! LOVE your CUTE birds, ADORE your pink background with the sparkling gold scallop frame, LOVE your bird-branch-nest scene too!!! Beautiful cards with new stamps set and dies.I love color combo and design.Thanks for sharing and super great blog hop! Awww!!!! Your cards are absolutely adorable!!!!! Love, love, love!!!! WOW Such vibrant color! Great cards. Wow the shaker idea seems like fun. I should try it soon. Love your bright designs and these new products are amazing! love both your cards, they are just adorable! Gorgeous! Really love the ink smooshing with abandoned coral!! Love both these sweet cards, the glitter scallop detail, watercolored background and gorgeous sequins are awesome with these super cute birdies! both cards are absolutely lovely!! Darling cards. Love all the detail. Love them both. I wanted to save to pinterest but couldn't figure out how. When I used my pin it button they don't show up on the cards to pick. Love the bright green/blue/ yellow coloring on the second card! The Birdie Note Stamp set is so adorable. It's a must have! So sweet and cute, Thanks for sharing. Thanks for sharing the beautiful cards Gayatri! These birds are just too cute! I love the vibrant colors you used, especially the blues and greens! Love the colors you used on your two cards. The stitched scalloped dies are so great. I think next month I will have to put in an order. The little chicks in the birdie friends stamps are equally cute. Thanks for the nice work. Loving these new products! I love both of your cards. Can't believe how cute that nest is….. Your cards are so cute with these sweet stamps and dies. I love this stamp set from PPP. I love shaker cards! Love the backgrounds on both cards & those adorable birdies! Great cards! Cute cards. I think the second card with the Momma and baby chick would also make an adorable Mother's Day card or a Welcome Baby card. Both very pretty cards!! Love your gold glittery frame on the first one & the awesome blue & green colors on your second! Lovely stamps and dies. Great cards with beautiful colors. So cute–love the colors and the framing. Your cards are both so pretty! I am a huge fan of pastels and your first card is a treat to my eyes! However, the bold, bright colors on the second card just pop, and grab my attention right away. Love them both for those reasons. TFS them with us! Great cards love your water coloring. 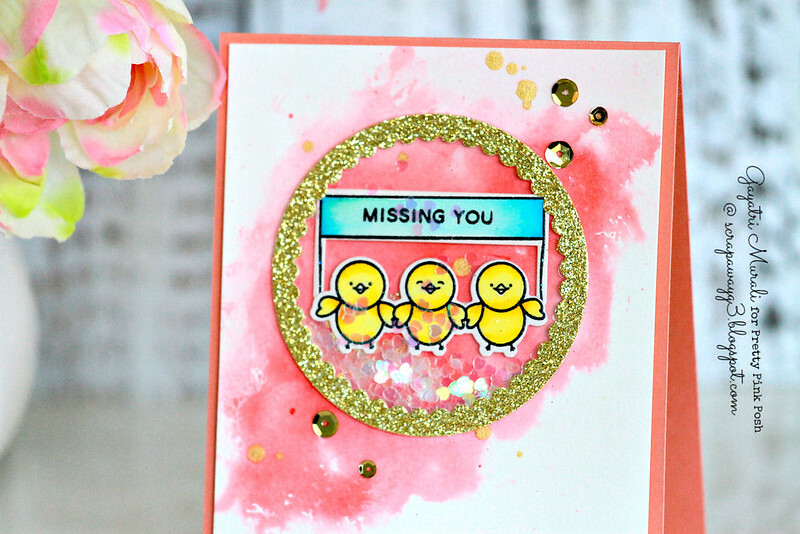 Love the gold with the watercolor and your pretty bright chickee card. It's a toss up between the glitter frame and your watercoloring – love them both! I love your bright and beautiful cards – the watercoloured background is gorgeous! Totally gorgeous cards Gayatri. I really love both your watercolour backgrounds. Great dies in this release! Love your cards, Gayatri. Such pretty colors ~ Thank you for sharing. Love love love that first card! It's gorgeous! Loving your first card!!! The colors are just perfect and I love the gold frame. There are so many fun ways to use these PPP dies! Thanks for sharing your sweet looks! Uber adorable and I love your use of color! I love your cards. I like the colors in the second card. Lovely cards, I especially love the shaker card with the colorwash background! Both cards are so cute! Great job! Both cards are cute but the first is my favorite. I love that it's a shaker card with a lovely watercolour background. It is really cool that there was some gold infused in the watercolour background, the gold circle die cut and lovely gold sequins. So cute! I love these happy, happy cards! I love these bright, cheerful cards! I love both of your cards, they are so sweet and happy! I love the background color with the gold frame. So pretty! Love the shaker card and the colors on the 2nd are so vibrant!! Both cards are just lovely, Gayatri. I especially love the gold circle shaker showcasing your image with the ink smooshing showing through. Great designs! Such super cards! The inlaid window on the second is fabulous! Love it! Stunning cards! Love the glitter scalloped circle! Beautiful watercolor backgrounds on these cardstock! And I love the gold glitter frame you made, too. Great cards & beautiful use of watercolors! Cute card. Love the gold glitter paper used for the circle scalloped die. Your first card just blew me away! That coral color splash is beautiful and then the shaker card with the adorable chickie trio makes it even more adorable!! Then you made a SECOND adorable one! You go girl!! Love this blog hop!! Love your smooshed watercolor background with gold spatter! Thanks for the inspiration!